There are some movies that have been done enough, or so I thought, when I heard actor Bradley Cooper had chosen to reinterpret the thrice-released A Star is Born. Loving the actor and lead actress, the mega-star Lady Gaga, as well as co-star Sam Elliott (who proves for what must be the hundredth time he has far more range than just playing a cowboy), I was determined to approach this new version with an open mind. Not only did it surpass my every expectation, it has validated bone fide hyphenates of director for Cooper and actress for Gaga. Even for someone who has seen every other permutation, A Star is Born, circa 2018, is absolutely worth seeing on the big screen. 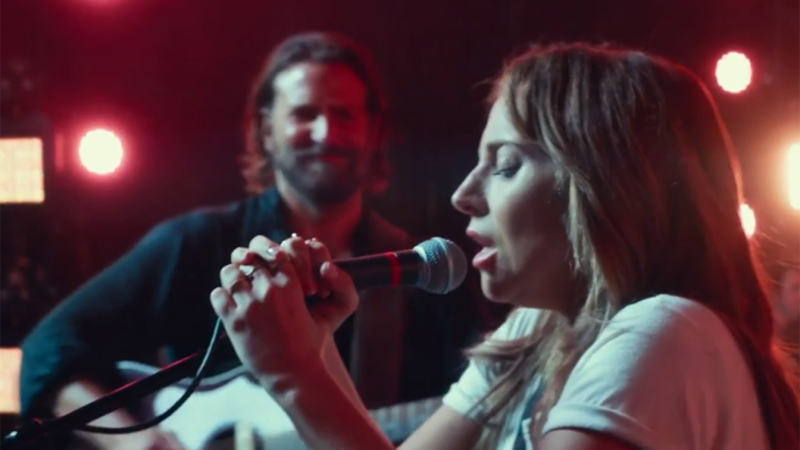 What make the film so exceptional is the instant and consistent chemistry between Cooper and Lady Gaga, the spectacular songs and they way they are believably filmed as part of the story, and the balance of great acting and charisma on display by the co-stars. The soundtrack will be an instant classic, with several songs that will be played incessantly through every platform. Lady Gaga will undoubtedly now be placed on the casting A list for leads in any and all studio releases. Cooper, for his part, has already found his next directing gig: he is attached to both star in and direct a Leonard Bernstein bio-pic. Perhaps a little background on the story’s history onscreen might shed some light on Cooper’s level of cheek at taking on such a classic as his directorial debut. The first incarnation of the movie, at least with the current name, was in 1937, and starred Janet Gaynor and Fredric March, as the up and coming actress, who dons the stage name Vicky Lester, and actor Norman Maine, who is on the way down. It was directed by William Wellman, who won a Best Story Oscar for it, and had already had the distinction of winning Best Film at the first Academy Awards for 1929’s Wings. The second, starring Judy Garland (who was nominated for Best Actress for her role) and James Mason, was directed by the legendary George Cukor, who brought the world The Philadelphia Story, Born Yesterday, and Gaslight, among dozens of classics, but won a Best Director Oscar only once, for 1964’s My Fair Lady. His A Star Is Born ranks #6 on the AFI’s list of best musicals in history. The third, and by many accounts, least critically successful incarnation, was in 1976, and featured Barbra Streisand and rock star Kris Kristofferson. It was directed by Frank Pierson, who was better know as writer of Dog Day Afternoon and Cool Hand Luke. The film was produced by Streisand, who had originally had Elvis in mind as her co-star. It was the third highest grossing film that year, and won her an Oscar as co-writer for Best Song with Evergreen, which became the biggest hit of her career. Enter Cooper, who took on the jobs as star and director in 2015, rescuing the remake from the development hell it had been in for years. His success is due, in part, to his love and fascination with the technical aspects of filmmaking, which he’d been studying from the beginning of his acting career. He has talked extensively about his obsession with editing, and spent months in the editing room, learning the craft, during the making of his Silver Linings Playbook and American Hustle. For A Star is Born, Cooper found ways of filming in front of real audiences at music festivals as famous as Glastonbury, as well as in between performances at other concerts to make those scenes believable. As co-screenwriter, he also helped build a strong story with every scene seated in the connection and interaction between the two lead characters. Those who know the arc of A Star is Born, know that, for a number of reasons, the story must stay essentially unchanged from version to version. It is and always will be a movie that is tragic and difficult to watch. Cooper’s A Star is Born is no less gutting than its predecessors. From the first moment Cooper’s hard-drinking, self-hating, reluctant celebrity Jackson Maine meets his protege and soon-to-be lover Allie, it is clear she could be either a way out of his darkness, or the sealing of his fate. Be prepared to cry. Be prepared to squirm in your seat at the level of commitment his character has for his self destruction. Also, though, know that you’ll get at least one or two songs stuck in your head, as I did, possibly for days. Essentially, new earworm stars have been born. Don’t be surprised if one of them is sung by Bradley Cooper, who is a far better singer than he has a right to be, given it is heaped on top of those eyes, acting talent, and, now we are seeing, directorial skill.